David Holyoake is a dual citzen Australian/British composer who spent most of his life in Melbourne and central Victoria and is now based in London and Brussels. He is interested in contemporary classical music as deep language, in the concept of duende and in using new music as a vehicle for environmental activism. Holyoake's music is published by Reed Music and his compositions are receiving increasing recognition and performances in the UK, Australia, Belgium and beyond. His works are accessible, technically challenging, and have been described as displaying emotional depth, providing musicians with excellent material for either performance or study purposes. His music was part of the National Gallery of Victoria's first-ever sound programme, Now Hear This, featuring new music of 10 Melbourne composers as part of the National Gallery's 'Melbourne Now' exhibition in November 2013 - March 2014. 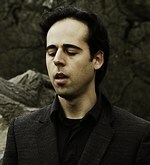 David Holyoake holds a Bachelor of Creative Arts and a Bachelor of Laws with Honours, both from the University of Melbourne, as well as performance qualifications from the Australian Board of Music Examinations. His concert works have been performed at venues such as the Great Hall of the National Gallery of Victoria, Melbourne, the Brisbane Convention Centre, the Royal Academy of Music London, Fairfields Hall London, Rich Mix London, Beursshouberg Brussels, and broadcast on ABC Classic FM and other media. Holyoake has also composed music in various genres for professional and amateur theatrical productions, for contemporary dance, and for television. In addition to his solo and chamber works, a number of commissions for soundtracks for film, theatre and contemporary dance can be heard on his spotify page here. In 2006, he won second prize for piano composition at the Brisbane finals of the Keys Australian Music Competition, and has been awarded grants from Arts Victoria, the UK Arts Council, and the Belgian Ministry of Culture to support his work. He has worked with or been commissioned by leading ensembles such as Silo String Quartet (Australia), members of Ensemble Musiques Nouvelles (Belgium), Ensemble Mendelssohn (London), and leading choreographers such as Gerard Van Dyke of Kage Physical Theatre. Holyoake is a member of the Melbourne Composers League and has had works selected for and performed at several of their concerts. In London, Holyoake completed a commission from Nyctolopic (supported by the UK Arts Council) to create an original score for a 1-hour new contemporary dance-theatre work called The City Will Crumble, inspired by the philosophy and aesthetic of film noir. In addition to being composer and experienced piano teacher, Holyoake is also an environmental campaigner and climate change policy expert. He founded Swarm Dynamics in London as a non profit arts organisation involving artists in imagineering positive sustainable futures. He believes musicians and artists should be better organised as a force for change. In this vein, he was commissioned by London based Ensemble Matisse to compose Extinct Birds, supported by the Arts Council of England. This was a new music creation in long form including sound recordings of extinct and endangered song birds against contemporary chamber music. By juxtaposing human song against the song of species whose destruction we have caused, Extinct Birds came with a powerful environmental message. In 2015, he was commissioned by Trio Metafora in Belgium, to compose The Message of the Hurricanes, a work for soprano, harp, flute about climate change and financial greed. This work was premiered in Brussels as part of the Origami new consonant music festival, and then taken to the Echternach international classical music festival in Luxembourg. In 2016-2017, Holyoake spent six months as composer in residence at Atelier Marcel Hastir in Brussels, a leading and historical cultural centre. During that time, he engaged with the historical archives of its recently deceased founder, artist and great humanitarian Marcel Hastir, who bravely helped save many Jews during the Nazi occupation of Belgium. The resulting work was premiered at the venue in May 2017 by acclaimed violinist Daniel Rubenstein from Ensemble Mendelssohn and composer David Holyoake at the piano, with grant support from the Contemporary Music Council and the Ministry of Culture. Memory of a Mensch : violin with piano (2017) Commissioned by Atelier Marcel Hastir. The message of the hurricanes : the warning in the Odyssee about unleashing climate change, for soprano, flute and harp (2015) Commissioned by Trio Metafora. Extinct birds : baritone voice with chamber ensemble (2013) Commissioned by Ensemble Matisse. Arabesque (trios: piano, violin, cello) (2008) Commissioned with funds from Arts Victoria 'Victoria Rocks' grant 2008 as part of 'Transfigurations' - 6 short chamber works by David Holyoake.